It is capitalism at its finest, touting the idea that your ‘happily ever after’ can only begin with a big party. To reach our hometown of Talagang, we get off the motorway at Balkassar and follow the road westward as it undulates over ridges and ravines, the classic terrain of the Potohar. Until a few years ago, the road leading up to town was flanked on both sides by farmland — lemon-coloured sarson in the winter, wheat turning from green to gold in the spring. Today, two sprawling buildings appear as we approach, surrounded by neat lawns and ample parking. Each weekend, the parking lot is filled with cars, guests driving in from as far as Lahore to partake in the country’s most prominent social phenomenon — the wedding. Throughout my childhood, weddings in Talagang were held in people’s front yards. The ultimate sign of wealth was the construction of a makeshift carpeted stage on which the dulhan, dolled up by her friends, was brought out. To accommodate larger groups or to create separate spaces for men and women, people sometimes hitched large red tents on empty plots of land near their house — the original marquees. As the town became wealthier and guest lists grew longer, we began to hear of weddings held in glittering venues on the highway, complaints from people who had to drive half an hour to Aisha’s baraat or Saleem’s walima because Aisha and Saleem’s parents were too fancy for a ghar ki shaadi. Soon, Talagang’s own investors jumped into the fray, constructing affordable wedding marquees five minutes from the main market. Today, these are perhaps the biggest businesses in town. In most ways, weddings in Punjab and the rest of the country follow worldwide trends of overspending and societal pressures. In the US, the average wedding costs more than $35,000. The subcontinent was abuzz last year with photos and videos of the horrific Ambani and Chopra-Jonas weddings. The wedding industrial complex is a worldwide phenomenon that spares no one. It is capitalism at its finest, touting the idea that your ‘happily ever after’ can only begin with a big party attended by several people you are barely acquainted with, festooned with flowers that will be compost the next day. Critique of Pakistani weddings has often centred on how expensive they have become, particularly for the middle-class that has a reputation to maintain but limited resources to aid in this face-keeping. There has been a lot of hand-wringing about the fazool kharchi, the heaps of wasted food, the designer wear. 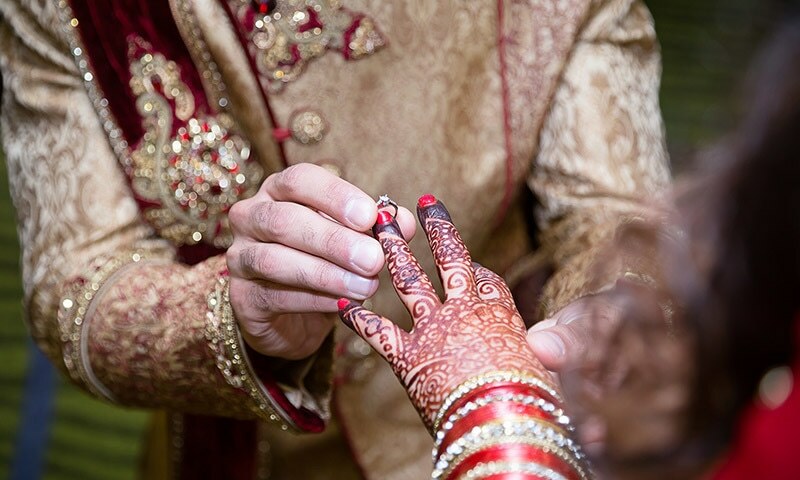 Religious-minded critics have mentioned that several of the events that are part of a traditional Pakistani wedding — dholki, mayoun, mehndi — have no grounding in Sharia and should be eschewed. Yet, it appears that all good things in life are biddat and the suggestion that we abandon timeless traditions simply because they do not fit the mold of Farhat Hashmi-esque Islam is ludicrous. Long live the mehndi. Let’s talk, instead, about the increasing soullessness of our weddings. Particularly in large cities, weddings have been simmered down to a formula and every single component is more joyless than the next one. You show up at the wedding of your father’s college friend’s daughter, someone you have never met and probably never will. You sit with legs tied together, looking around with a mixture of eagerness and trepidation for a familiar face with whom you can small talk, ask the same questions, give the same, socially correct answers. A drone hovers over your head, and somehow you’re supposed to be okay with an invasive recording machine capturing every unguarded moment. Yet, are there really any unguarded moments at these weddings? Everyone sits and stands for the benefit of the photographer’s camera that roves the crowd for ‘candid’ clicks. At mehndis, more and more hosts put on dance performances blaring Bollywood hits or the Bollywood-inspired songs that movies on this side of the border now churn out. To the background of these songs, groups of young people perform hackneyed dance moves and the rest of the congregation looks on with hands folded over their chests, half-entertained and half-bored, wondering which song will be the last one before the food containers open. Unlike the traditional dhol and luddi, these performances are not meant to include everyone in celebration but to enchant and mesmerise. They are not expressions of happiness, but an assertion of glamour and glitter, a show that is lined with shiny dance floors, adorned stages and theatrical entrances. Baraats and walimas are even more transactional. People arrive as late as they can and often still get there before the hosts do. They sit around with their phones out, texting, Whatsapping, taking the occasional selfie in the hope that an Instagram-worthy photo might make the insipidity worth it. The sound of metal rubbing against metal indicates that the waiters milling about have finally opened the food. Everyone rushes to the serving tables for the actual event of the night — the feast. People heap on to their plates the same three or four oily dishes that we have collectively decided represent our entire culinary portfolio. As soon as people are done eating, they surreptitiously hand their envelopes to the host and take leave. After all, they have to save energy for tomorrow’s wedding. If weddings of distant relatives and family friends are so boring, why do we continue to attend them? Because our social landscape is desolate. Our streets are too unsafe for the middle-class. Our parks are too awami for the upper-class. Our restaurants are too expensive for the lower-class. Particularly for women, movement and mobility are severely restricted — they cannot hang out with friends in the evenings, go to concerts where they might be around airay ghairay mard, or even loiter in parks. People & Society: What lies behind the gates of Pakistan's elite communities? As soon as any sign of their femininity becomes apparent, they are either overtly or discreetly told to spend more and more time indoors, away from the streets where boys play cricket, hidden from the prying eyes of neighbours. There are some constructive activities available, such as festivals and literary talks, but those are restricted to major cities and are often accessible and affordable only for the well-off. The wedding is the one event that we have all decided is worthy of our time — culturally appropriate and societally approved. The pinnacle of our social architecture, therefore, is an anonymous event where we join a faceless crowd to eat on someone else’s rupiah, hand them payment for that food and drive home. Yet, weddings are not without redemption. 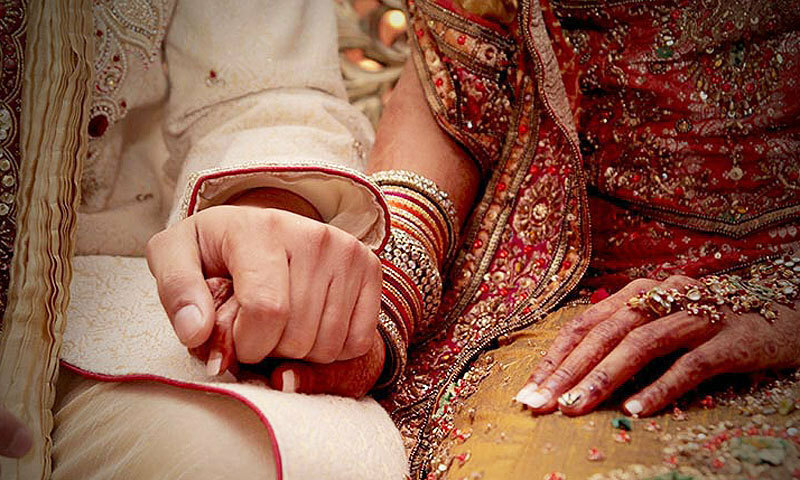 For close friends and family, the shaadi is a momentous event. They are the ones who enjoy the most, staying back after the food and the festivities have faded. In a country with a vast emigrant and expatriate population, a wedding is reason to return home and see old faces. In villages, it can signify the reunion of clans whose members are now scattered around the country and the world. It can be a homecoming, a chance to sit together over chai with the people you grew up with. Weddings also provide a rare space for female celebration. 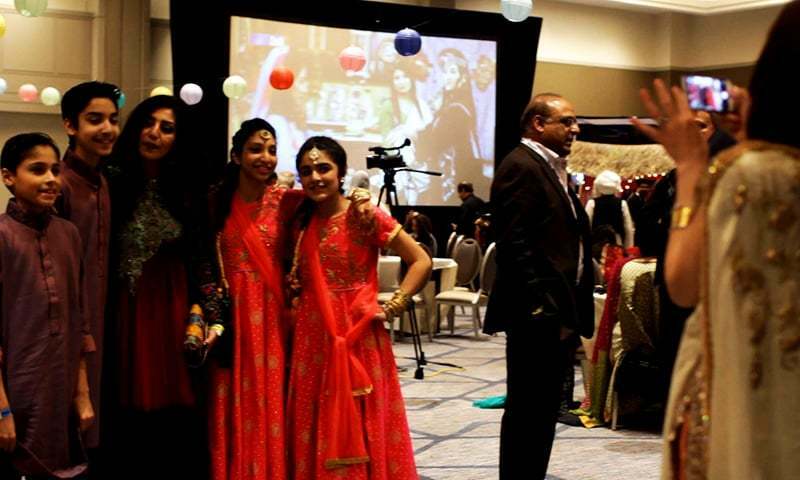 Given the limited opportunities many Pakistani women have to move about and mingle outside of their immediate family, it is no shock that they enjoy these gatherings way more than men do. It presents them with a chance to dress up — it always struck me as a child that the women in my family were discouraged from putting on an innocent lipstick for school or work, but could attend shaadis adorned like dolls. At weddings, women meet old and new friends and enjoy visibility in a society that allows little daily space for them. Women are also at the forefront of wedding planning and organisation. Undoubtedly, the vendor side is still predominantly male, with exceptions in the form of waitresses in segregated events and female singers in rural weddings. On the buyer side, however, it is mostly women who make key decisions about venues, clothing and decorations. Women bargain with caterers and go to inner cities in search of cheaper flowers and lighting. This is one of the few industries in the country that involves female participation from all classes. Perhaps I am cynical, but it strikes me as hollow that women are allowed to make major decisions only as long as they pertain to this one event. They are not allowed to choose whom they marry, but they are allowed to pick their dress for the wedding. The nikahnama, signed with flourish at grand mosques and well-attended events, treats women as property, exchanged between husband and father for a pre-decided amount of money. In the marriages that ensue, women are still handicapped by law and society, held back by economic dependence and the stigmatisation of divorce. Despite my nostalgia for old rural weddings, I remember one grotesque tradition that was part of these events: the vari, held in the baithak decked out with the bride’s dowry. All the women of the village were invited, so that the bride’s parents could loudly display every single lovingly-bought but ultimately useless consumer item — the embroidered clothes, the makeup sets, the shoes — which they were sending off their daughter with. The vari is thankfully on its way out but the tradition of dowry itself remains entrenched in most parts of our society. Sometimes, this dowry is used as an excuse to give women a smaller, if any, share of inheritance. This seems like a terrible bargain. Keep that Dawlance refrigerator and give me a more valuable asset — land. The hope is that over time we can learn to prioritise true joy over displays of wealth and glitz, that we can create a social landscape that does not rely exclusively on the weddings of distant family friends. At the end of the day, however, weddings will continue to feature heavily in our lives. In 2017, Pakistan’s median age was 22.5 years old. Nearly 64 per cent of the country’s population was below the age of 30, with 29pc falling between the ages of 15 and 29. That is a lot of young people, and they are all coming of age. For those of us waiting for a respite from weddings, a halt in this noisy transmission, the writing is on the wall; Pakistan’s going to be partying for a while. Dur e Aziz Amna is a writer based in Rawalpindi and New York. Her work has appeared in The News, Roads & Kingdoms, Longreads, and The London Magazine, among others. She is currently working on her first novel. Attending wedding in Pakistan is not a cheap affair. Husbands are under pressure to even take out loans to buy expensive dresses, so that their spouses can flaunt away. Good & reality. We may be devided after 47 but atleast we all in subcontinent have continued all the ill's of & in socity. Change is must & education & other reforms can saves both in subcontinent India. Dowry & high show off in merriges art to be changed for betterment of mankind. Sooner we do it better it will be for us. Weddings in the subcontinent are a waste of resources and undue burden to all involved. I am all for court marriage and a lunch for close friends and relatives at the home of the couple. Frankly attended very few in my 35 years of life, don't like gatherings. haha, such a hilarious insight into the wedding trends going on in our country. an awesome article. Great job! You are on point about the current stituation regarding these outrageous weddings in general.However, what is the solution for this madness. How can we as a nation change this trend that has more negatives than positives? Biryani is on my mind rather than the bride or groom. Okay here i make a Solomon pledge to not accept or demand Dowry from my future wife, will anyone please talk about HER demands? In KP/FATA and Baluchistan (Pushtoon societies) bridegroom's family is the victim, i want someone to write on this as well. The description of the things that go around weddings, the pictures, the customs could be anywhere in India with regional variations. Some Pakistanis may not like it but Pakistani culture is not Arab culture, it has its roots in India. Much more fun and colorful than Arab culture I must say. So cherish it, enjoy it, don't blindly copy the Arabs and let's stop fighting. Good prose is a treat in itself. Thank you Ms Amna. Same in the Sudhun tribe of azad Kashmir . The Groom's side spends. For both the brides expense and their own. Pride is taken in being on bringing the bride with pride. Dowry is an unknown phenomenon. If some family "asks" or accepts ...... they are shunned for generations. The West has research to back a simple formula. The more expensive the wedding, the shorter the marriage. Maybe somebody needs this research here too. Is it HER demand or the parents' demand? I have pushtoon friends who spoke about the demand for too much mehr. And yes that is a problem but do wives even keep that money or the parents eat it up? Wedding, in the middle-class of our society, is becoming an stress creating factor for parents. You will always find, in the parent's earnest desires, a wish to wed his/her child with glamour and glitter. An event not up to the expectation brings a severe sense of collapse. @Maha Qasim, the pomp and show and wastage of money is twice in the US. Desis are desis wherever they go. The expenditure is twice, but there is no respect or commitment for time, as in Pakistan. For a 7 PM invitation, guests start arriving at 8:30 PM. Moreover, in Pakistan at least you don't get a note with the invitation card for not bringing boxed gifts. Good article. Anyway I love weddings, especially the booze they serve behind the scenes. What an amazing write-up.. Its everywhere including religious functions here in India as well. Simplicity is no longer a virtue. The gist of the entire article could be nailed down to a single word appearing in it - "soullessness" .. Couldn't have put it better. Lavish weddings should be banned all over Pakistan. More than half the population are struggling to keep a roof over their head and be able to provide food for their families and the rich are super rich out there. Sad that country cannot provide basic neccessities of live e.g hydro, clean water, proper sewer and safety of lives. Very very sad. hitting the nail on the head with that paragraph about limited leisure opportunities. would be a shame to take away weddings from this already parched landscape. No justification for spending so much money on one occasion. Better to invest it new house for married coup,e or save it for the education of their children. This closely-observed, beautifully written article is a clear depiction of our society in which our inner pollution has taken over the entire landscape of moralities, which in modern day is called as ''priorities''. A society that's so confused between needs & wants can never move towards the promised lands of self-actualization and will continue on to degrade on all social ventures. It is because pakistan as a nation is becoming gluttonous and what used to be a simple ceremony is now a stage set for every one to showoff how wealthy they are and how lavish their life styles are. Whats even worse is that these expensive ceremonies of showmanship are now becoming a part of our culture. In other words what was once considered a luxury and an in necessary hassle is now a requirement and its really important or otherwise your family could be socially ostracized. Thank you author, somebody said it!!!! Very well researched article indeed, this was always in my mind what the author has mentioned. I am at a loss to understand what kind of human-beings are us who do everything just to portray that we are glamourous. I have strong objections in the expenditures incurred by the parents of the both bride & groom. The wastage of food in these weddings make me cry. I do have no method to stop this happening everywhere. In our country there is no heed paid to the Education which is the need of the time. All sorts of efforts are made to arrange weddings on a massive scale. There are Marriage Halls & Marquees which are the integral part of these functions. Money is spent so lavishly that I doubt it to be earned with hard labour. The scenario of the start of the meals is also very much astonishing to me as people rush like animals. ( Sorry ). I am convinced that the population of Pakistan, as a result of these efforts, is well beyond 350 Millions ! Amna Jee. You nailed it. What an excellent write up.. Here you use the name/ word Subcontinent when describing Indians. Just call it India. We are Pakistanis. We belong to two different countries and civilizations. Geographic close, still two different societies. @ismailnust20, Well even in that case all the money that groom family pays will be considered by some as a way to buy the bride. So even the groom family is a victim but its pakistan we never think men as victim brah..
Dur rai Aziz, you are doing a great service for your fellow citizens. Make the wedding a simple affair.